Bookcase has 4 shelves in a playful house shape to help make reading fun! 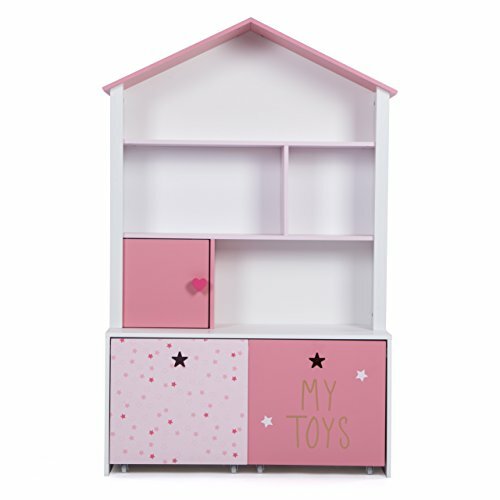 This bookshelf is large enough to hold your child's growing assortment of books, dolls,toys and so on. It even has space to display picture frames in your child's bedroom, playroom, nursery or the living room. This bookcase helps keep your little one's room clean while at the same time promoting organization and encouraging reading. This bookcase is easy to assemble and construction on this engineered wood storage furniture offers solid support and long-lasting durability. Using baking varnish,bright color, extravagance, with a strong visual impact. Without sealing side, non-toxic environmental protection,fire prevention performance is good.